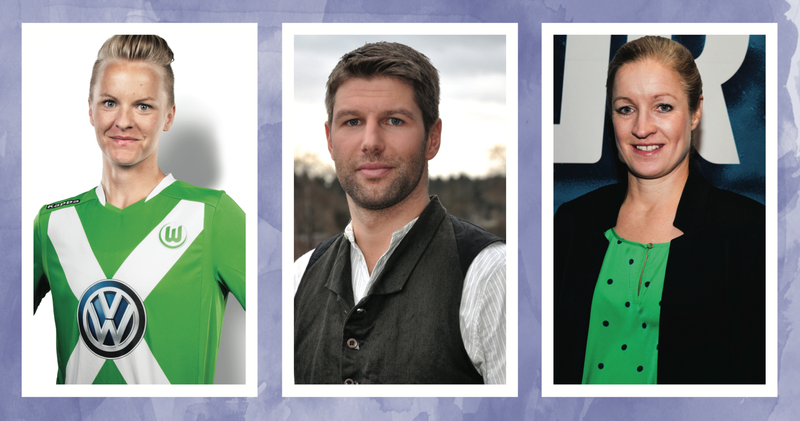 The German Football Star Thomas Hitzlsperger, the Swedish National Football Team player Nilla Fischer and the former professional football player Victoria Sandell Svensson are proud ambassadors for EuroGames Stockholm in 2015. Previously announced Ambassadors are the actress and transgender activist Aleksa Lundberg, the Swedish politician Birgitta Ohlsson, the Artist Lars Lerin and The Swedish National Handball player Tobias Karlsson. EuroGames Stockholm 2015 is held between August 5th – 9th 2015. - It's a great honor for me to be an Ambassador for EuroGames Stockholm 2015 and all that EuroGames stands for is close to my heart. To practice your sport without being subjected to sexism, homophobia or racism is to me a basic human right. For me, sports similar to solidarity and EuroGames is a great platform where we all are welcome to practice our sport and can feel welcome and comfortable regardless of gender, sexuality or background, says the German Football player Thomas Hitzlsperger. - As an athlete, I wish to prevent all forms of discrimination within sport, such as sexism, homophobia and racism. But above all, I wholeheartedly support everyone's right to practice sports. For me it’s a human right! I’m grateful because I know EuroGames Stockholm 2015 will be a platform for "love and liberty" for so many, says The Swedish National Football Team player Nilla Fischer. - I'm really proud to be an Ambassador for the EuroGames Stockholm 2015. I think it’s incredibly important to stand up for human equality regardless of race, sexual orientation or gender identity. All people are equal. I want to participate and strive for a society free from discrimination. In addition, I love sports and want to support the right to practice your sport regardless of gender and sexuality, says the former Swedish professional football player Victoria Sandell Svensson. - We are proud to present three such respected football role models as ambassadors for EuroGames Stockholm 2015. Nilla, Thomas and Victoria are incredibly important profiles on as well as off the field. It means a lot and is absolutely necessary when we are addressing LGBTQ and sport, says Jakob Jansson, President of EuroGames Stockholm 2015. As an Ambassador for EuroGames Stockholm you are standing behind EGS’s values of human equality regardless of gender identity, gender expression and sexual orientation in sports, culture and politics. You get the chance to raise awareness of these questions and be involved in the planning and implementation of one of the biggest events in Stockholm by 2015. Thomas Hitzlsperger is a former German National Football Team Player who played in the English club Everton until 2013 when he announced that he would stop playing football. During his career he managed to play over 50 National Team matches for Germany and won the Bronze Medal in FIFA World Cup 2006 and the Silver Medal in UEFA European Football Championship in 2008. Nilla Fischer is a Swedish football player who changed from midfield to center back and did a great success. Today she is the Team Captain for the Champions League champions Wolfsburg and center back of the Swedish National Football Team. She has a passionate commitment to gender equality and LGBTQ issues since a few years back when she met her wife. Nilla Fischer received “The LGBTQ Person Of The Year” at QX Gay Gala in 2014. Victoria Sandell Svensson is one of the most accomplished soccer players in Swedish football history with her 166 National Team matches. She has made 68 goals as a Swedish National Football player and have won the prestigious Diamantbollen twice. In 2009 Victoria stopped playing football and started to work at the Swedish Football Association to get former football players to work as mentors for younger football teams and as Sports Director on ElitFotboll Dam. EuroGames is among the world's largest LGBTQ-events, founded by the European Gay and Lesbian Sport Federation (EGLSF) in 1992 to combat discrimination and promote the right to engage in sport, politics and culture - regardless of sexual orientation, gender, religion, age, ethnic origin, political beliefs, or athletic or artistic ability. EuroGames Stockholm is a sports, cultural and political event which will take place between the 5th and 9th of August 2015 and is expected to attract over 5.000 participants and more than 250.000 visitors. EuroGames is held about three times per decade. Previous host cities include Barcelona, Paris, London and Antwerp. Previously announced Ambassadors are the actress and transgender activist Aleksa Lundberg, the Swedish politician Birgitta Ohlsson, the Artist Lars Lerin and The Swedish National Handball player Tobias Karlsson.